House design from the 70s was modern and forward looking. In the 70s, people wanted a modern home, with modern appliances and were happy for it to look modern on the outside. Now people are beginning to appreciate again the style and designs from the seventies. There is a trend towards valuing original features in homes from the 70s. So rather than rip out that coloured bathroom suite, that 70s' kitchen or those sapele doors, why not restore them to their former glory? If you want to get the retro look inside your home, there are plenty of retro pattern wallpapers and modern contemporary furniture available that would not have looked out of place in the 70s. The 70s' house followed on from designs of the 60s; the overall look was modern. There was no attempt to pretend that the house was built in a previous era. Windows were generally large. The contrasting coloured panel in the main window, as in the photograph above, was a fashionable touch. Exterior walls were either plain, or decorated with tile hanging, as above, or with wooden boarding. The roofs were shallow pitched, and the 60s' fashion of a flat roof for garages, porches, or anywhere else other than the main roof, was still popular. The houses were built as terraced, semi or detached. Link-detached houses, joined by the garage for example, were popular. If you are buying a seventies' house today, look out for pitched roof conversions of roofs that were meant to be flat. The flat roof had a bad reputation for leaking and most modern builders' solution was to replace it with a pitched one. Often this spoilt the period look of the house. Look out for original features. Bathrooms were often coloured; not fashionable today, but almost certain to come back. If yours hasn't been ripped out, then it's a bonus. Look for original 70s kitchens. In the 70s the pine look was just coming in, but most kitchens were modern and streamlined. Look out for formica tops and units in bright colours - oranges, or yellows were popular, as were blue and white kitchens. Also carefully consider the windows. 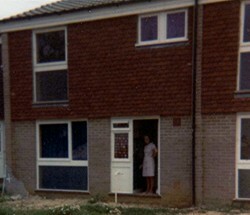 70s' houses work reasonably well with UPVC as long as it is a like-for-like replacement. Lattice windows look awful on a 70s house - it can never be a country cottage. Interior doors in seventies' houses were often ripe for replacing with modern panel doors. 70s interior doors were usually flush fitting, often with a wood finish that needed little or no maintenance. If your 70s' house still has the original doors, then again it's a plus. If you want to preserve or restore as 70s' style house, then now is the time. You will be a pioneer setting a trend that others will follow. Plus it will be fun not to follow the crowd.